Researchers will often go to the ends of the Earth in search of answers to the mysteries of science. Forming the Aleutian Arc in the Northern Pacific Ocean, approximately 3,400 miles from Albuquerque and the University of New Mexico, the Aleutian Islands are a perfect destination to conduct research that could one day, impact Earth and its inhabitants. The Aleutian Islands, a chain of 14 large volcanic islands and 55 smaller ones that belong to both the United States and Russia, are just such a location. The Islands occupy an area of more than 6,800 square miles and extend approximately 1,200 miles westward from the Alaska Peninsula toward the Kamchatka Peninsula in Russia. The Aleutian Islands mark the dividing line between the Bering Sea to the north and the Pacific Ocean to the south. Last fall, an expedition spearheaded by GeoPRISMS (Geodynamic Processes at Rifting and Subducting Margins), a community effort that studies the origin and evolution of continental margins funded by the National Science Foundation (NSF), organized a group of scientists to deploy several multi-disciplinary projects including seismic instruments, sample tephras and volcanic gases, and repair and restore monitoring stations for the Alaska Volcano Observatory (AVO) on seven active volcanoes in 19 days on the Aleutian Islands. The expedition was conceived originally by a team of geologists and funded by NSF several years ago. Overall, the group included 10 scientists, four crew members, a helicopter pilot and mechanic. Once the scientists got to Adak Island located on Kuluk Bay, where the weather is harsh and the winds burn, they set out on the Maritime Maid, a vessel equipped with Bell 407 helicopter on a boat/helicopter expedition (a helicopter from the boat is the only way to get to the Islands), to explore seven different active volcanoes including: Buldir, Kiska, Segula, Semisopochnoi, Gareloi, Tanaga and Kanaga. 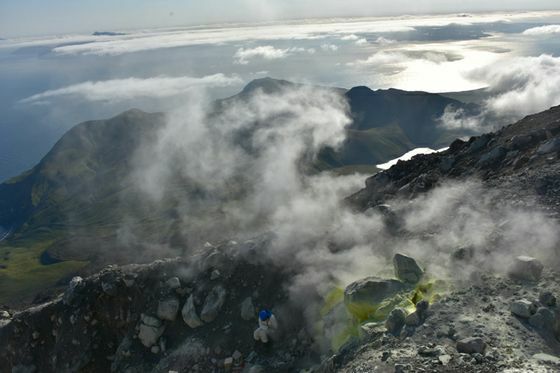 The combined expedition, which included University of New Mexico Department of Earth and Planetary Sciences Professor Tobias Fischer, and lead Research Geologist Elizabeth Cottrell, curator and director of the Global Volcanism Program, National Museum of Natural History, Smithsonian Institution, the scientists spent four weeks on the remote westernmost Aleutian Islands. They were part of a second group of scientists to work on the western Aleutians following a team that conducted research on the eastern Aleutian Islands. The collaboration also included the U.S. Geological Service and Alaska Volcano Center, the Fish and Wildlife Service, the Deep Carbon Observatory Deep Carbon Degassing initiative (DCO-DECADE ), and NSF’s Polar Programs, which handled all the logistics and essentially enabled Fischer to accompany the group due to his research work with DCO. Polar Field Services and the crew of the Maritime Maid were essential to the success of these projects. “The expense for expeditions to remote areas of the world is enormous when you include the boat, helicopter, maintenance, sample collection and supplies,” Fischer said. Fischer’s part in the collaboration was to collect toxic gas samples pouring out of the summits at each of the volcanoes. 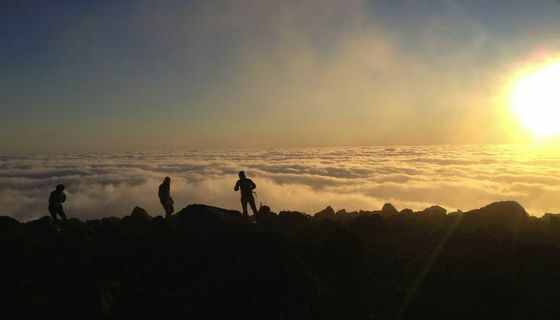 Gas team at work above the clouds at 1,200 meters on Kiska Volcano. Photo credit: Dr. Taryn Lopez, University of Alaska. Fischer and the gas chemists conducted some of the most dangerous work during the expedition having to obtain samples of toxic gases from the volcano summits. Fischer is now looking for answers to the data collected including: the source of the volatiles and how do they vary between the different volcanoes; how do tectonics affect what’s degassing from the magmas; and to characterize each volcano for its state of activity and potential future hazards. crater of Kanaga Volcano taking notes and making gas measurements. Photo credit: Professor Tobias Fischer, University of New Mexico.